All Praise is due to Allah Taala, the Lord of the Worlds and Peace and Salutation be upon our beloved Prophet Nabi Muhammad(PBUH). I report back on the fact-finding mission in Ethiopia and Somalia regarding the Islamic situation of the Blind there. Our Principal Moulana Hassan Abdul Kader Murchie left South Africa on the 20 March 2018 for Ethiopia. He landed on 21 March 2018,and the next day, together with Brother Jamal Muhammad, they left for Shashamane town, which is 250 kilometres away from the capital Addis Ababa. 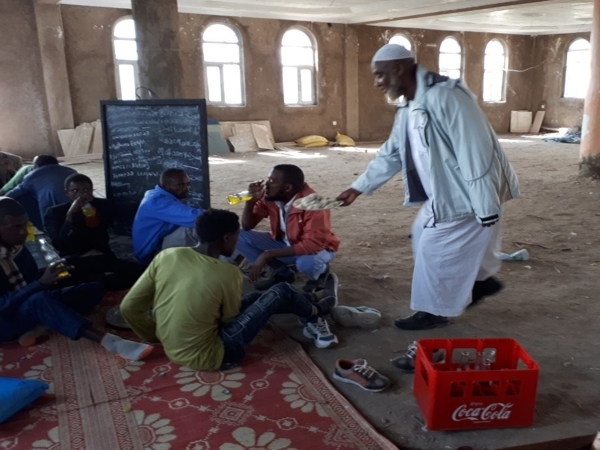 Preparations were made prior to Moulana reaching Ethiopia for him to meet Blind students as these students have never had access to the Braille Qur'an and they wish to study Islam. A meeting was held after Zohr Salah at Masjid Khulafa in Shashamane. Over 25 blind boys attended this meeting. One young girl also came with her mother. This meeting was supposed to be only for males, but the mother was insistent that she wanted her daughter to also learn about Islam. Nevertheless, the meeting took place and it was found that out of the 25 attendees, only 4 of them knew a little Braille. The rest of them had never been to school before. As braille is a universal language where all the dots are based on a similar sound representation,which is to say,if a person knows one language for example, English, then for him to learn Arabic or Urdu would be easier as the representation of those letters will have the same sign.The Arabic letter Ba and English B will be the same. Alhamdulillah, Moulana gave a talk to the students bouying their hope. The worry of the attendees was what would happen to them once Moulana had left.Moulana distributed copies of the Braille Qur'an and the Braille primer that will teach a person a step -by -step way to learn to read the Holy Quran in Braille. Arrangements were made for a teacher (who is sighted)to come to South Africa for a training period of 40 days. Once he is trained, he will go back to Shashamane and will try to assist the students there. The following day, Moulana left Addis Ababa for Somalia, specifically the town of Hargiesa.There he was met by former Staff member of Madrassa An-Noor the Blind, Sheikh Ahmad. He also met the principal of a school 'Doses of Hope's Foundation'. Her name is Fatima Fadoumu Alim. We went to her school and we saw the situation there. There were about 20 male and female students. Most of them are totally blind. One brother had no hands at all, but he was able to type using a Perkins Brallier with his feet and he was able to orally read the braille that he had thus written. This was very inspirational to us, as this young man was a victim of war and he lost both his hands in a mine explosion. He was still able to read Braille. All the students expressed a desire to learn to read the Holy Qur'an in Braille. Alhamdulillah, one young man we found through the effort of Sheikh Ahmad,had the Braille Quran which was supplied to him from Madrassa An-Noor for the Blind. His name is Abdul Fatah and he read some parts of the Qur'an in Braille. He expressed his desire to come to South Africa and become an Alim, Insha Allah.Efforts are being made for him to come to South Africa. May Allah Accept them all Insha Allah. On Monday, 26 March 2018, Moulana travelled to Mogadishu. Upon reaching Mogadishu, he was met by brother Abikar and brother Abdurahman. Brother Abdurahman holds the important post of Disability Officer for the whole of Somalia. Alhamdulillah, Somalia is a very beautiful country. One can hear the Azaan all over especially at Fajr time when over 50 different Azaans can be heard simultaneously.This is very lovely. The atmosphere is beautiful. Most of the woman wear the long burka and there is a notable busyness and industry to be noted amongst the people. Surprisingly, I did not find anyone begging. Alhamdulillah, the situation of the Country is very safe and the security is very strict when entering the airport and leaving the airport. I liased with brother Abdurahman and few meetings were arranged. I also went to Al-Basir School for the Blind. This is run by brother Abikar,the principal, and Madrassa An-Noor for the blind has organised 3 scholarships for blind students of that school to come to South Africa and study here. Alhamdulillah, thereafter we met the Minister of Education Abdirahman Dahir Osman. He was very attentive and also appreciative of our coming to Somalia. He welcomed us most warmly and said that this is the first time that he has visitors looking to assist the blind in their country.He expressed his wishes that this relationship continues. He assured visitors that came with me that legislation will be put in place for the benefit of Special Needs education. I also visited the An-Noor School for the Blind's principal, Abdul Fatah Muhamaad Dhahir and the Deputy Governor General, Sister Rawdha. Alhamdulillah, all of them were very appreciative and happy that we came all the way from South Africa to Somalia.May Allah Subhanahu Wa Ta'ala open the doors of mercy especially for the Hidayat and guidance for the Blind. Alhamdulillah, we also presented a few of our DAISY players to a few people. This is basically an audio library in their hands. Everyone was thrilled with it and all wanted to have something similar. May Allah Make it such that our blind brothers and sisters around the world enjoy the Hidayat and the Noor of the Qur'an and Hadith of our beloved Nabi Muhammad (PBUH).We thank our sponsors and all people that have assisted us to spread the Noor and light to the blind around the world. May Almighty Allah Ta'aala grant us all His help and may He accept all our feeble efforts. Aameen.